August 5th will be Double Stack HORSE. Fun for all including Razz!! I will be off packing for a few days, should be around Friday for the Donkament. Check out the Mookie tonight and Riverchasers on Thursday. Played in the Mondays at the Hoy, with 7 runners last night. Never could get anything going, and when I finally pushed my 66 on a QQx flop (after having raised a reraiser 3X his bet), I find out I am WAY behind with my opponent having KQ. The river was another Queen, giving him quads. The $15 Token Frenzy for a $75 Token was pretty soft last night, with 157 runners it paid 30 tokens. I played good solid poker the whole time, not trying to get cute, and was really never out of the Top 30 the entire tournament for the token win. I will be saving that one for the next Big Game. Next week is Double Stack Pot Limit Omaha Hi. Let the donking commence!! Another week, another Skillz game. 7 Stud Hi/Lo this week. Hopefully we will keep with our numbers running in the Mid Teens to Low 20's as usual. Hope to see everyone there! Congratulations to twoblackaces on the win, TheCloserX5 for 2nd, and iam23skidoo for finishing 3rd. As far as how I play, well lets just move on. Between just playing bad and bricking enough to build another house, I was lucky to last to 18th of 22 players. Next Week will be 7 Card Stud Hi/Lo, so that should be fun. I will try to be there if I can stay well enough, but it will go on, and I have already paid, so there is the chance of stealing my chips if I am too sick to play. Double Stack led to a lot of play, with no one being knocked out for the first hour and a half. Unfortunely the one who did finally Gigli the damn tournament was yours truly. I probably played some hands longer then I should have, but the final hand against Hoyazo when I pushed my Kings in Stud Hi, ended up making trip Kings, and lose to Hoy's Quad 4's was just the story of my night. Hoy did end up winning the whole damn thing though. I am sure he will have more to say about it on his blog. Next week will be Razz, for all of you who missed it this week from the HOSE rotation. And I have decided to stick with the Double Stack, allowing more play in these. I would also suggest playing the Turbo $8.70 2-Table SNGs for a Tier 1 Token ($26). These are really soft in my opinion. I have played eight in the last two days, winning tokens in 5 of them, $14 (6th place) in the sixth, and still final tabling the other two. I switch my usual Tight-Semi Passive play to Tight-Agressive, and it works great for me. 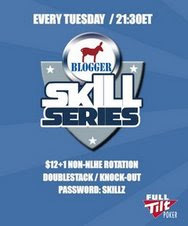 Blogger Skill Game Tonight - DS H.O.S.E. I will start publishing a leaderboard of money winners, and maybe even a spreadsheet of the top 10 finishes. I will also put out a list of what the upcoming events for the next 6 weeks will be. With a very nice turnout of 22 players, which would pay to three places. The 1500 chip stacks seemed to cause some tight play early, as it took us almost 30 minutes to lose our first player, and only lost five by the first break. I ended up being bubble boy for the final table, after halving pots with the low several times in a row against bigger stacks, I finally got a two pair high that lost to a flush on the river. Congratulation to PinkyStinky for the win, Irongirl for the bridesmaid spot, and Bdidde for finishing third. Mookie ended up being the cash bubble boy. Dont forget, Mookie tonight, Riverchaseres Thursday, and for those not watching Fireworks on Friday, I am guessing Katitude is still having the Blonkament Rebuy. Come back next week, as the game will be Double Stack H.O.S.E. And to make up for the lack of Razz, Razz will likely be the game the week after!